A rotary multi tool is a good addition to any workshop and can be used in many applications where larger tools are not suitable. 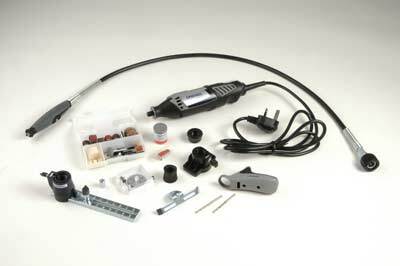 Dremel have produced multi tools for many years, and this 4000 comes in a solid plastic carry case. There are 65 accessories supplied, as well as a flexi drive, a detailer grip, a shaping platform that allows for sanding and grinding to be carried out at 90° and 45°, and a circle/line cutting attachment. There is also a 45-piece basic kit available without these add-ons. The speed range is between 5,000-35,000rpm, and enables the tool to be used for many applications on various materials. A slow start system is incorporated that removes any sudden jolts during start-up. The speed control is easily accessible and clearly marked with the speed range. The main tool and flexi shaft handle are wrapped in dense rubber that gives comfortable use over prolonged periods, which I noticed straight away. This, coupled with its good ergonomic design, made using the 4000 an enjoyable experience. Within the carry case lid is a compartment that holds the instruction booklet and other documents. I really liked this simple addition for quick reference when needed, instead of having to search for the information. 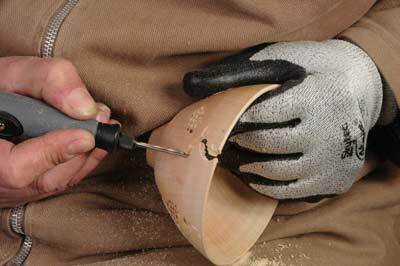 to hold and the addition of two grip points for the thumb and first finger made it easily controllable for fine work. The speed range available from 5,000-35,000 enabled me to find the most efficient speed for the wood that I was cutting. Altering the speed was immediate and easy to do, and having the numbers written on the speed dial enables quick changes. The small router cutter supplied cut easily through the wood. The speed even under heavy cuts did not slow the tool with the comfortable grip, making fine adjustments to the cutting shape easy to achieve. Next, I removed the flexi drive and attached the new detailer grip. This is basically a support device that rests the tool onto the hand while the tool is used in a writing action for fine detail/engraving type work - the same as one would use a pen. This again I found gave comfort for prolonged use and removed fatigue from my fingers as the grip weight supports the weight. During testing, I also used the 4000 for sanding, cutting on plastic, wood and metal. On all materials it worked well, and I did not find any faults with its design or use. This is a very versatile tool, which for the money, is also good value. It opens up scope to carry out far more within my work, and is also a very useful addition for the home. For ease of use, build quality, value for money, and versatility, you can't go wrong with this multi tool. Not bad at all!